Once you've responded to an inquiry by making a reservation offer, the prospective guest will receive the e-mail cover letter with a summary of your offer. Within the summary e-mail will be a Web link that will take the guest back to the VRconnection Web site so that they may either accept or decline your offer (see image to the right). This reservation summary page becomes your 'link' to the guest and they can return to it at any time to get the current status of their reservation. The options at the bottom of the page will change as the transaction is progressed from offer through security deposit refund. At this stage, the guest has one of two options -- to either accept or decline your offer. If the guest chooses to accept your offer, the system will first ask for some additional personal information. At a minimum, they will be asked to verify or provide their full name, phone number, and mailing address. 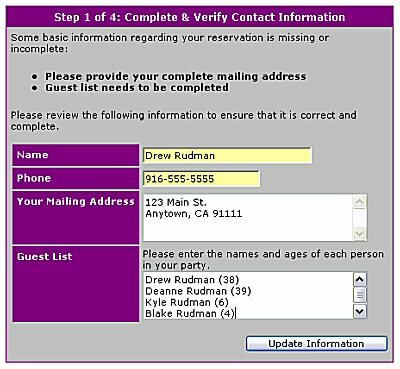 You can also configure your offer to ask the guest to fill out a guest list for all members of their party (see image to the left). 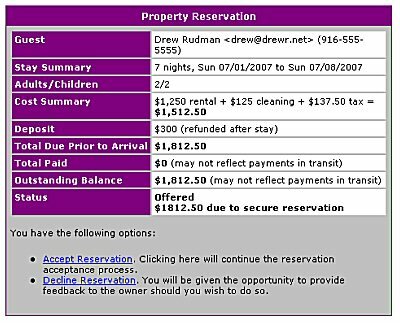 After gathering information from the guest, VRconnection will present them with the rental agreement that was configured during the offer creation (right). 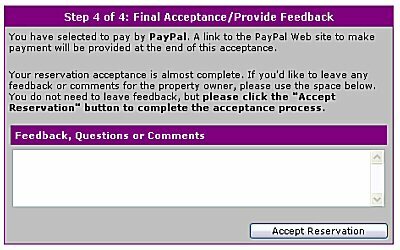 Depending on the settings, the system will either indicate that acceptance of the terms is being made 'online', in which case a time stamped copy of the agreement will be e-mailed to both parties upon final acceptance, or alternately the system will indicate that a printed and signed copy of the agreement will need to mailed. A printable version will be made available upon completion, but at this point the guest is expected to read and agree to the terms before continuing. Of course, you can configure the offer to bypass this step by indicating you do not wish to present an agreement, although this is not recommended. You should always lay out the terms of your rental and have the guest agree to them in some fashion. After the agreement has been accepted, it is time to offer the guest their payment options (image to left). The options presented will mirror the ones you configured during the offer creation. VRconnection currently supports several different payment options you can offer to your guests. It is important to note that VRconnection does not actually get involved in directly handing actual payment of rental monies. In all cases, the system will instruct the guest to either make all checks out to you and mail payment to your mailing address or to contact you directly to arrange for other payment forms such as Credit Card by Phone or Direct Deposit. One notable exception is payment via Credit Card by PayPal. If you offer payment in this manner and the guest selects this option, VRconnection will provide the guest with a direct link to a formatted invoice for their rental on the PayPal website. Payment will still be made directly into your PayPal account, but VRconnection will take care of creating the correct PayPal invoice for the rental deposit and balance payments. A final step offers the guest the option to leave you feedback or ask any questions (image to right). Anything entered into the feedback box will be added to the transaction as well as the acceptance confirmation message you will receive when the guest presses the final acceptance button. 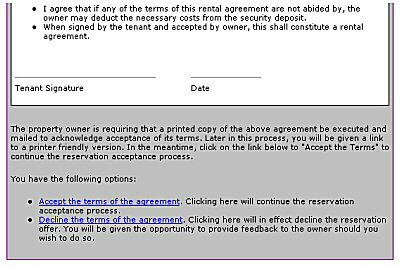 If the rental agreement acceptance was configured to be handled 'online', the system will e-mail a time stamped copy of the agreement to both parties for their records. Finally, a confirmation message will be e-mailed to the guest with a summary of any additional actions needed on their part (printing, signing, and mailing the agreement, mailing payment, any additional instruction configured by you during offer creation.) The property's availability calendar will be updated to reflect that a tentative reservation has been accepted for the dates involved and the transaction itself will be marked as accepted and will be awaiting receipt of payment. 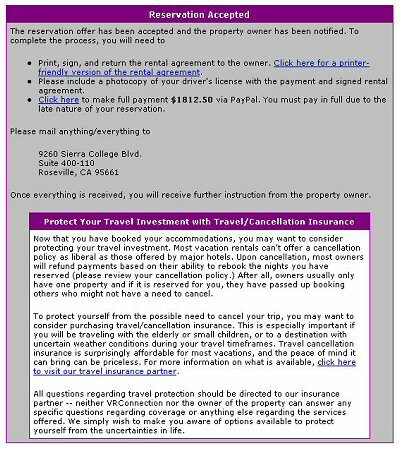 Much of the information contained in the booking confirmation e-mail is displayed for the guest upon final acceptance (image to left). It is also added to their 'Guest Link' page described earlier, so that in case they misplace the e-mail confirmation, they can always access the latest information about their reservation. Additionally, VRconnection has partnered with a well known travel cancellation insurance provider and provides the guest with a little background on trip insurance, complete with an option to receive additional information as well as purchase insurance for their upcoming trip. This can go a long way in reducing the stress an owner might feel if the guest is forced to cancel for some reason or weather conditions make completing the stay difficult. The guest will have been educated on this possibility and will have been given the option to protect themselves. It is their risk not to do so. If you like what you see so far, click here to list and manage your property with VRconnection. Otherwise, let's continue the tutorial with managing reservations.